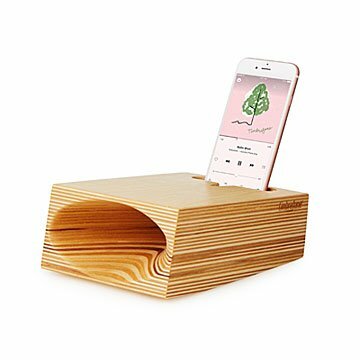 Connect your phone to this sleek birch speaker, which amplifies sound through an acoustic cone. House, patio, or picnic, this Baltic birch speaker is a natural fit. Without cords or battery power, it amplifies sound through its unique acoustic cone and comfortably supports all iPhones (up to 6+ with most phone cases). Handmade in High Ridge, Missouri. The desire for a unique and personal wedding gift blossomed into the woodworking studio founded by long time friends Marc Stitzlein and Rich Norton. Nestled in High Ridge Missouri, their studio is filled with a unique team of artists and craftspeople who work with their hands, minds, and hearts. Together they blend an innovative spirit with the nostalgia of artisan craftsmanship to handcraft their unique and clever products. Its works really good. Very convenient. My husband loves it! 5yr wedding anniversary gift. Fantastic! I loved it from the instant I saw the picture and description in the catalog. Everyone enjoyed passing it around trying to guess what it could be and they were all amazed when I finally showed them how it worked. Truly unique and attractive product and no more cords to tangle or waiting for speakers to charge! Looks nice. Not so useful. Bought this for my boss who is a big music lover. Looks great and works great in his office. Works very well, simplistic and nice looking! Nice clean lines, simple and nice looking. Good conversation piece. Good sound, even works well with heavy duty phone case. Battery life is unbelievable! I guess they only draw back may be that it is a bit pricey.